Please add $18 for shipping, handling, & insurance. 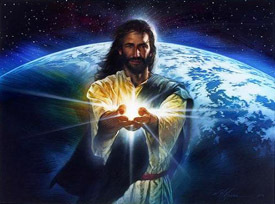 John 8:12 tells us that Jesus is the Light of the World: "I am the light of the world: he that followeth me shall not walk in darkness, but shall have the light of life." Light of the World copyright© 2004 by Nathan Greene is prohibited from being copied. Nathan Greene art, light of the world, inspirational paintings, art work, canvases, images, paintings, pictures, and prints of Light of the World by artist Nathan Greene for sale. Light of the World painting by Seventh Day Adventist artist Nathan Greene can be purchased in art print or canvas form at special sale prices at Christ-Centered Art.